Children involved in the child welfare system, particularly those in foster care or subsidized adoption, are a high-needs, complex population – with greater incidences of chronic physical and mental health conditions. Foster care children have more chronic medical conditions than children outside of the foster care system. More than half of foster care children have at least two chronic conditions, and one-quarter have three or more chronic conditions. They also have higher rates of certain conditions than children not in foster care, such as vision disorders, dental problems, and jaw disorders. The population is also more likely to need inpatient care of any kind when compared to their peers. Children in foster care also have high rates of behavior or emotional problems. Research shows that about 52% of children in foster care, and about 79% of children in a group home or residential program are at risk of a behavioral or emotional problem. And 45% of foster care children and 75% of children in group or residential care received outpatient behavioral health services. Additionally, foster care children are prescribed psychotropic medications at a disproportionately higher rate compared to other groups of children. How Do States Deliver Medicaid Benefits To Children In The Foster Care System? Which States Require Children In Foster Care To Be Enrolled In Medicaid Managed Care? What States Are Planning To Move Foster Care Children To Managed Care? 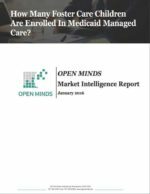 How Many Children In Foster Care Are Enrolled In Medicaid Managed Care? All products are included with an Elite Membership! Be sure to check out our membership levels to see all the included features and products!